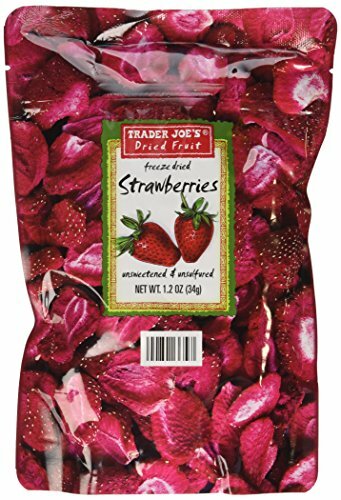 Trader Joe's Unsweetened Freeze Dried Strawberries are made from ripe, fresh fruit so they taste as close to the flavor of freshly picked as possible. In fact, 12 ounces of fresh strawberries are dried to fill each bag. These strawberries make a great quick snack and are ideal for sprinkling on a bowl of cereal. Great for cereal or to eat as a healthy snack! Kids love them! Only 130 calories per bag (1.2oz bag)!